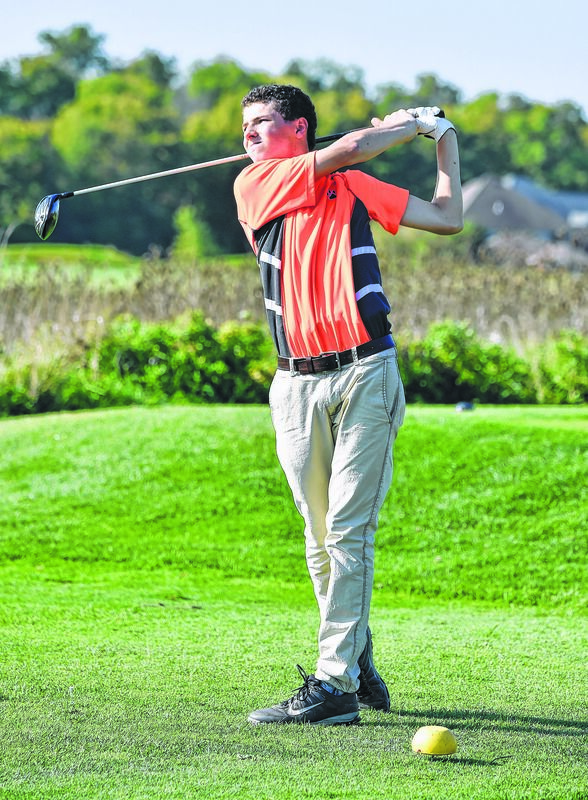 FINDLAY — Galion’s Jack McElligott golf season ended Thursday at the Division II district golf tournament at Red Hawk Run Golf Course in Findlay. The sophomore was the Tigers’ most consistent golfer this season. On the par-72 Red Hawk Run layout, McElligott shot a 44 on the front nine and a 41 on the back. His 85 was 13-shots over par. With a round of 82 earlier this week at the sectional tournament at Sawmill Creek in Huron, McElligott qualified as an individual for the district tournament. He was the only Galion golfer to advance. The top two teams and top two individual scorers — not on a team — in Findlay qualified for the state tournament. Toledo Central Catholic won the district title with a 319. Archbold also qualified, with a 336. Local teams included Ontario, third place with a 339; and Clear Fork, ninth with a 379. Galion’s Jack McElligott watches a good shot off the 11th tee during tournament play at Red Hawk Run Golf in Findlay on Thursday morning. Photo by Walt Butler Jr.
and thus qualified for the state tournament.